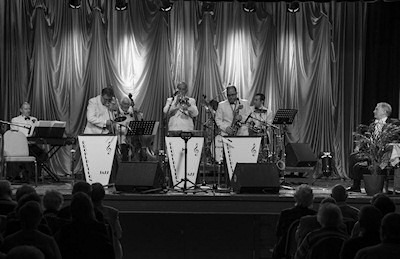 Some of the south's top musicians feature in 'Prohibition Jazz', performing music from the 1920's to the 1940's with special attention to Trad, Mainstream and Dixieland Jazz. Music from the great bands such as Louis Armstrong, King Oliver, Jelly Roll Morton and Kid Ory, Roaring 20's music featuring arrangements from bands such as Paul Whiteman, Duke Ellington, Jack Hylton and music from the Swing Era from Artie Shaw, Count Basie and Glenn Miller. Concerts normally take the shape of a first half of Traditional and Dixieland Jazz, followed by a 1920's set in the second. Audience involvement, foot-tapping music and the high standard of musicianship guarantee a memorable evening! PROHIBITION ERA - "the period from 1920-1933 when the sale of alcoholic beverages was prohibited in the United States by a constitutional amendment"